garden is flourishing with lovely flowers. Unfortunately weeds are growing abundantly as well. Trees are blossoming and as such nature is telling us it is time to thrive! These are times of transformation and breakthroughs. You may be feeling extra emotional right now, and sensitivity may be enhanced. As such it is an important time to listen to your emotions, acknowledge them and be gentle with yourself and others. All in all it is a time that brings change. Especially relationships, and not just the romantic kind, will be in the limelight of this change. The transformational energy may help you see some relationships have served their soul purpose, yet other ones may actually expand and grow. The one thing that runs through it all though, is to let go of all that is withholding you from shining your inner light. The full moon on April 19 will help you with this. 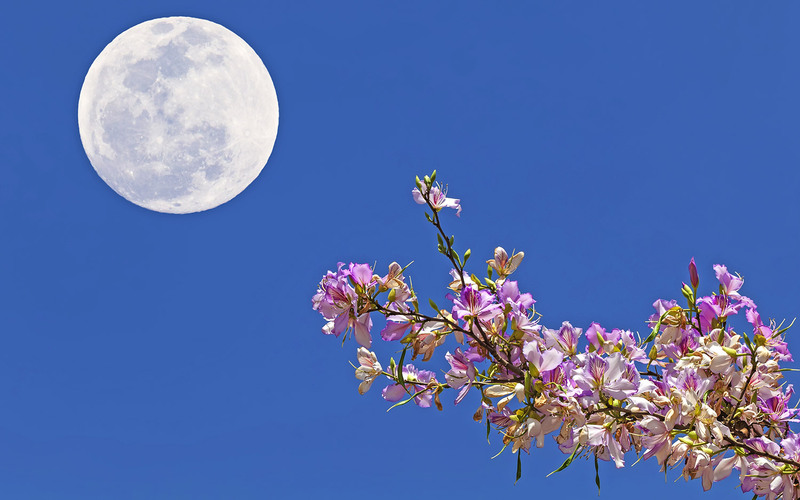 The Moon of Awakening is usually around Beltane and this moon’s name refers to the awakening of nature in spring. This is a great time for planting seeds. As you do so, you may have the intention that the seeds you are planting represent certain things in your life you wish to manifest or renew. The full moon then helps to let go of everything that hinders the growth of your dreams, intentions and goals. As such you may choose what metaphorical seeds to water and what weeds to get rid of. Like last year we will work with the energy of Archangel Metatron during this meditation. You may then clear and dedicate the space. I do this by calling in an ascension column of light, the platinum net and ascension flame. Especially the one called archangel Michael creates a high vibration and calls in protection at the same time. 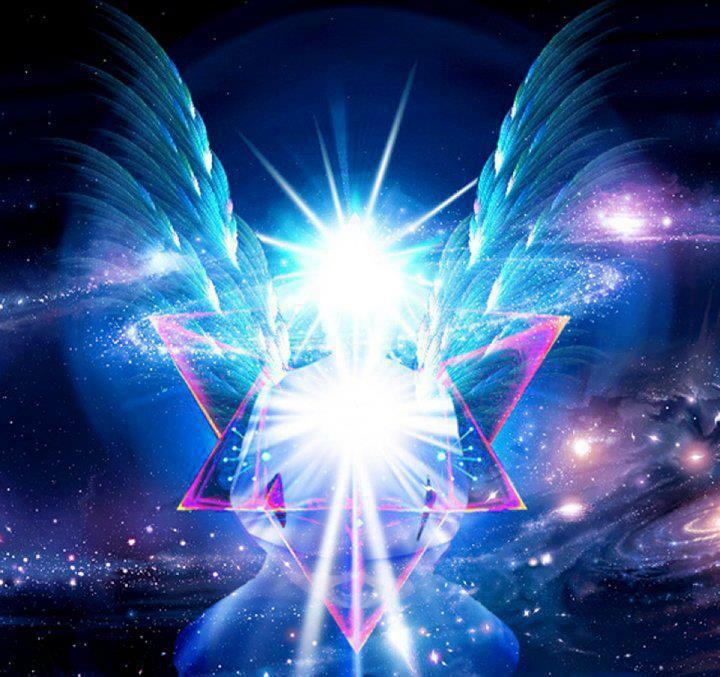 This entry was posted in Angel meditation, Light work, Moon Meditation and tagged 2019, april 19, awakening, full moon, meditation, metatron on April 17, 2019 by Angel Light Heart. This entry was posted in Angel meditation, Light work, Moon Meditation and tagged 2019, archangel Michael, full moon, light work, March 21, meditation, protection, solar flares, spring equinox, spring moon on March 20, 2019 by Angel Light Heart. It is a privilege to work with Angels, Archangels and other Beings of Light. It is not reserved just for me. I believe that everyone can connect to the Light worlds, with the right meditative focus, alignment and spiritual development. Archangel Michael has guided me since the mid ’90’s. I started by channeling his messages and he still guides me to this day. The first Crystal Angel Essence I ever made, was that of Archangel Michael. Recently it was time to make a new batch. Every essence is attuned anew when creating it again. Sometimes that means that the gemstone elixir gets extra gems added to it. At other times it means that there is a specific energy that is being brought forward that adds an extra theme to work with, when using the essence. quite a lot of energy. It also brought forward many old patterns between different family members. Though we wanted what was best for each other, the energy of fear and other patterns did interfere with the good intentions and the situation definitely needed some Light. Prior to attuning the elixir, I had received a healing in my pyramid of Light in the 5th dimension (I have learned to work with this from Ronna Hermans channeling of Archangel Michael). A new dragon guide had already appeared in the week before. She brought me to the pyramid, breathing air and Light into the situation, after which Archangel Michael cut the necessary cords. When attuning the essence, Michael first referred to this healing. I am sharing his channeled words with you as I know many sensitives and light workers care for family members, friends and partners but also have a tendency to step into helper mode, depleting their own energies. This channeling reminds us that we cannot learn other peoples lessons for them. Though it is important to be there for them with compassion and love, holding the space for them, we must also let them learn their own lessons and grow at their own time and speed. I Am Archangel Michael and we have cut important Karmic cords. As your dragon sister Avonlea impressed upon you it is not time for ou to learn to rise above judgment. You can only do this with compassion and detachment. While you work through your own soul lessons, they have to work through theirs. You cannot do it for them. Though you can support and advice when asked for, they still need to go their own path at their own pace. If they head along to trouble and refuse to listen, they will need to learn to deal with the consequences of their own choices. Just like you cannot learn other peoples lessons for them, you do not help them by picking up their junk. They need to see all of the effects of their choices to learn the true lesson and choose differently. Yours is not to step in, but to still be present. It is much like holding the space in Angelic Reiki. you can hold the space for their Light to come through, if they ask for your help. But you do not have to rush in again and again to clean up their mess to the detriment of your being. This is a lesson for all those who wish to become spirit guides. In this case you can hold the situation in the highest Light and then let go. As soon as you find yourself frustrated, taking over responsibility or drawn into drama, step back. Ground. Center. Step into your own highest Light. Send your Light to the situation for the highest benefit of all. Then let go. This is in effect Light work on the personal level. Let go of the outcome and focus on the Light instead. Let us now attune the essence and add this important lesson on holding the Light and clearing karma, whilst disentangling from al that is not your responsibility. During the attuning of the essence, it was placed in the Blue Ray and I received an initiation into this Cosmic ray. The ray was placed in my aura, hands and third eye, so that I can use it in my Lightwork and in healing. I have found the essences grow with the energy of the moment, themes in my own life and in that of others. In this way, higher and higher Light frequencies can be incorporated, which in turn help us to integrate more of our own Soul Light. With big thanks to Archangel Michael and Avonlea for this great support. 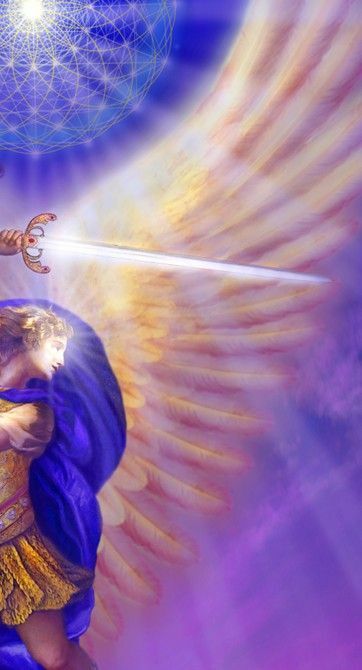 This entry was posted in Angel Blog Article, Angel Healing, Channeling and tagged archangel Michael, channeling, crystal angel essence, helper, soul lessons on March 12, 2019 by Angel Light Heart. The full supermoon is almost upon us. A lovely time to meditate. Feel free to join in the meditation on February 19. It has been glorious weather here in the Netherlands. I am actually sitting outside in the sunshine, typing this on my trusted laptop. The almost full moon was very visible, even during daytime, these last few days. 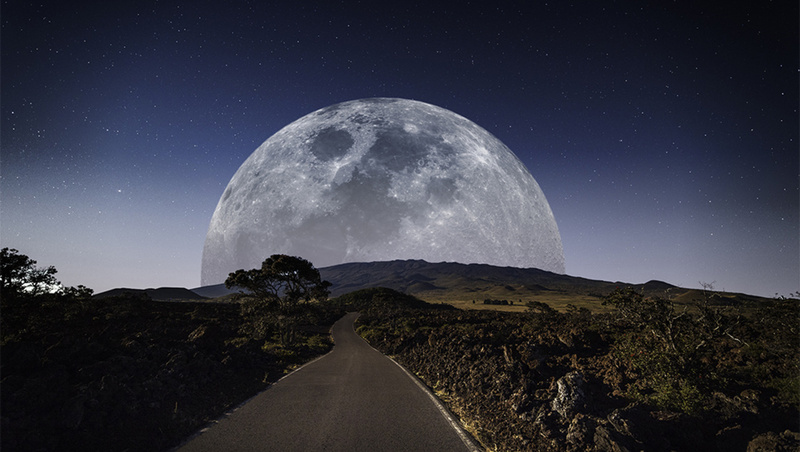 As a supermoon it appears much bigger, seemingly closer to earth. As such its energies van also be felt more strongly. We are asked to be true to ourselves as we connect to others and to live from unconditional love, allowing each and every one to be who they truly are…including yourself. I always feel the snow moon is magical as it is all about the new seeds yet to germinate. Since the heaviest snow usually falls during this month, native tribes of the north and east most often called the full Moon around this time of year the Full Snow Moon. Some tribes also referred to this Moon as the Full Hunger Moon, since harsh weather conditions in their areas made hunting very difficult. 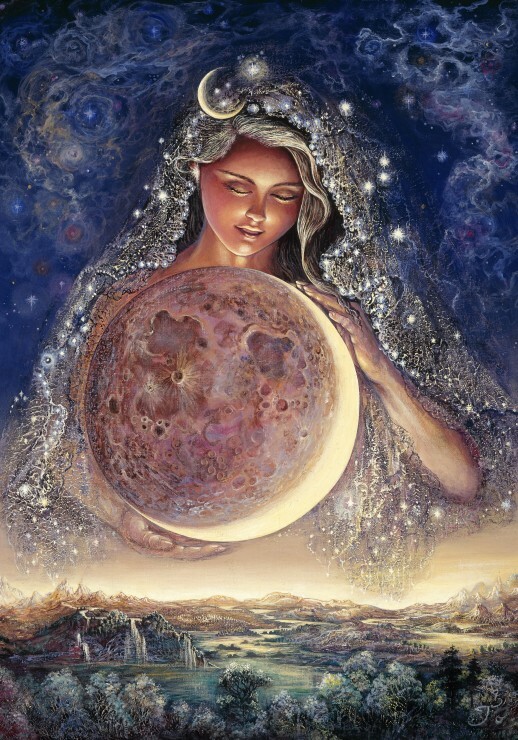 The Snow Moon falls between Imbolc and Ostara. Between sowing (Imbolc) and germination (Ostara) is the moment where we wait to see if something will be viable. Not every seed that reaches the earth, will germinate. Likewise not all ideas that come to mind are achievable. Sometimes it is necessary to handy to let go of something before something new can avail. about what we want to do, want to postpone and want to leave behind. This moon shows us the harshness of nature and the importance of using our energy wisely. Therefore it is better not to spend energy on plans that are not feasible. Give your energy to those things you know are achievable and in line with your Soul’s Purpose (as meditated upon on the previous Full Moon). Make a list for yourself of all things that are currently superfluous. This can give a great sense of relief. Let us ask archangel Uriel to shine his light on what seeds to plant this year! Archangel Uriel is one of the seven Archangels that stand at the throne of the Creator and one of the four major Archangels that serve humanity. Uriel rules the mental plane such as our thoughts and ideas, creativity, insights, judgment, universal consciousness and divine order. Uriel can help us link to the spiritual realms and he can show us how to find our inner power. When we shift in consciousness we help the entire human kingdom’s shift into higher realms of consciousness. Uriel helps with this very important process, especially in these times of Cosmic Change. 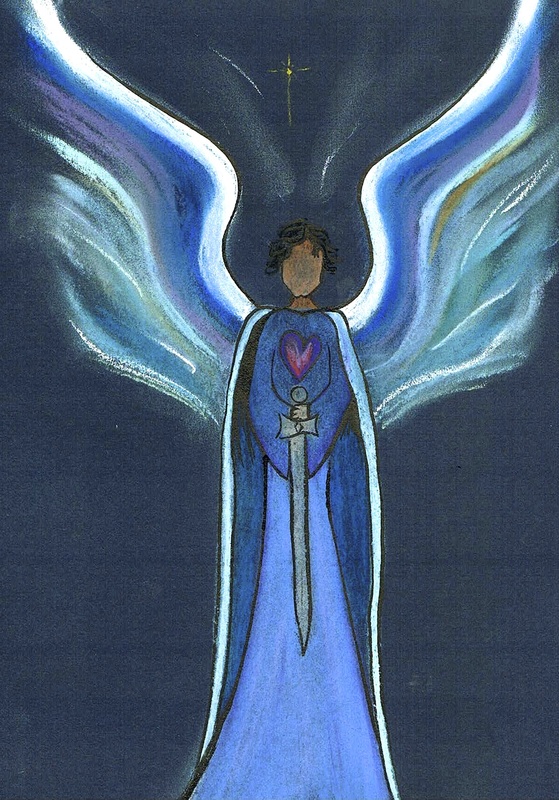 Uriel is also known as the Archangel of Salvation and he helps us when we want to heal every aspect of lives. He helps us let go of disappointments and turn them into victories. He shows us the hidden blessings in times of adversity. And he helps us release the painful burdens and memories of the past through the application of unconditional forgiveness. With his flaming sword he purifies mental and emotional understanding. He transmutes lower vibrational energies into enlightened spiritual understanding. 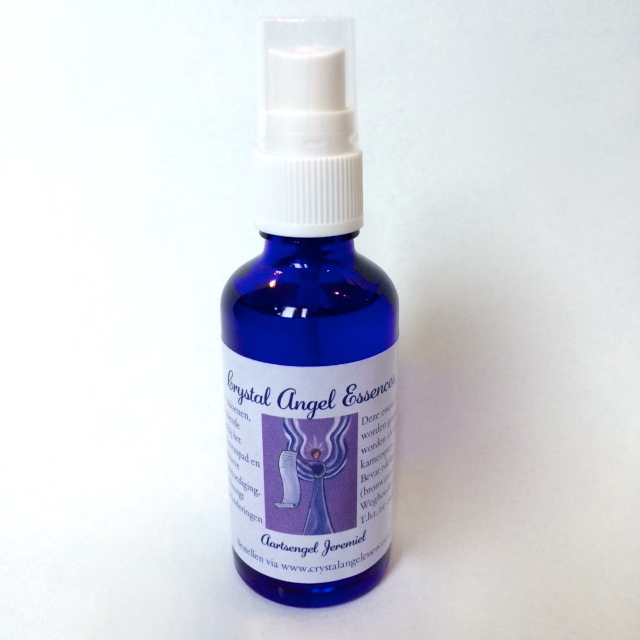 You can use the Crystal Angel Essence Uriel to support you in this special time. 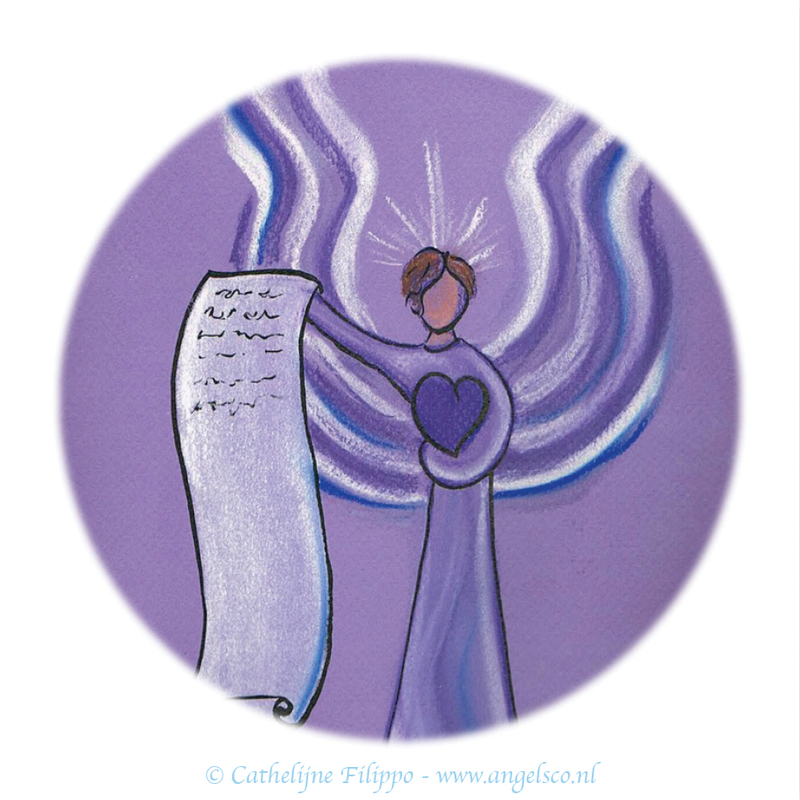 You may want to prepare for the meditation by writing down your list with superfluous things. Sit quietly and ground yourself by connecting to your earth star chakra (20-30 cm beneath your feet) and connect to the centre of the earth and crystalline grid through this wonderful chakra. You may then clear and dedicate the space. I do this by calling in an ascension column of light, the platinum net and ascension flame. I also the aura sprays I have developed with my collegue Sabine called Crystal Angel Essences. Especially the Archangel Michael Essence creates a high vibration and calls in protection at the same time. Connect to all the other Light workers so we may form a network of Light around the planet. 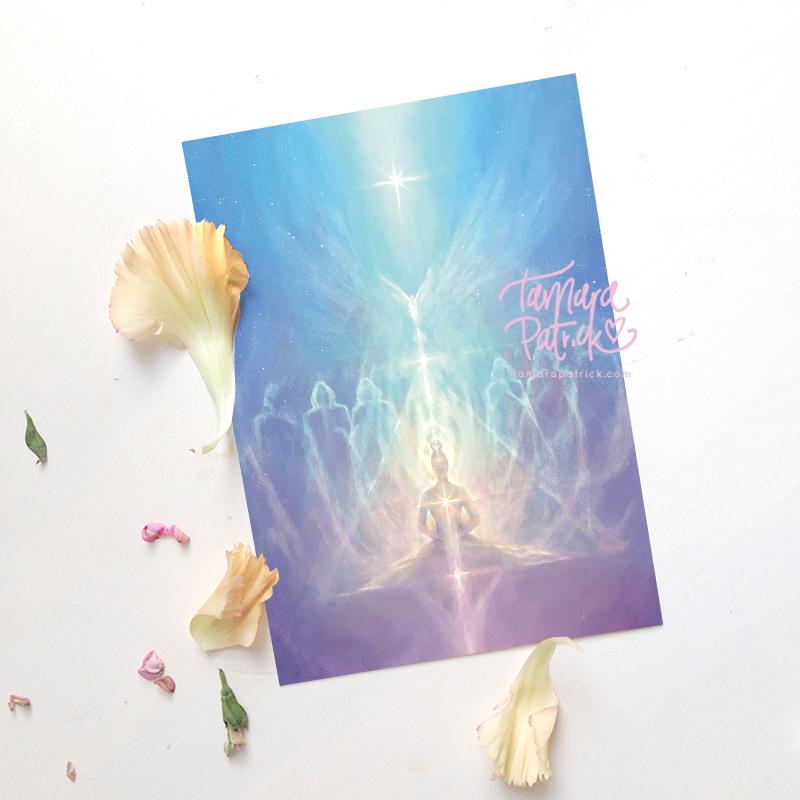 You may imagine drawing in Cosmic Golden Light through your Crown chakra into your heart and sending it from your heart to me and all other light workers participating. When we all do this we form a powerful network of Light that helps heal the earth. When you are done, imagine us all simultaneously sending the energy to areas of conflict and the refugees to bring Light, Love, Freedom and Healing. You may want to then send it to other areas and people you feel need it at this time. Now imagine travelling through a moonlit snow landscape. The snow sparkles and glistens in the soft glow of the moon. The air is crisp and fresh and you inhale it deeply. You feel the soft snow underneath your feet and heal its soft cracking sound. You carry a beautiful pouch with you, inlaid with moonstones. You know this pouch holds all your ideas and plans for the coming year. You soon reach a crystal cave that lights up from within. 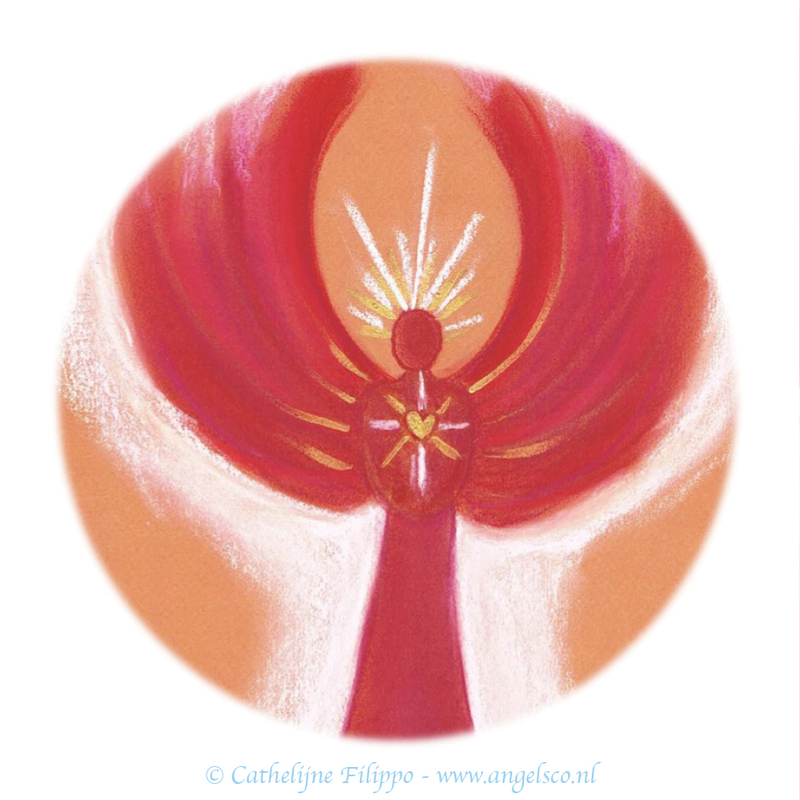 At the entrance you see a radiant Angel that radiates a pure, ruby red and golden energy. You intuitively know this is the Archangel Uriel. Uriel awaits you and motions you to come in. He tells you the entrance to this cave is a portal to the fifth or higher Dimensions and will bring you to that Dimension that currently suits your Soul best. You feel a shift in energy as you enter a hall that shimmers with light. 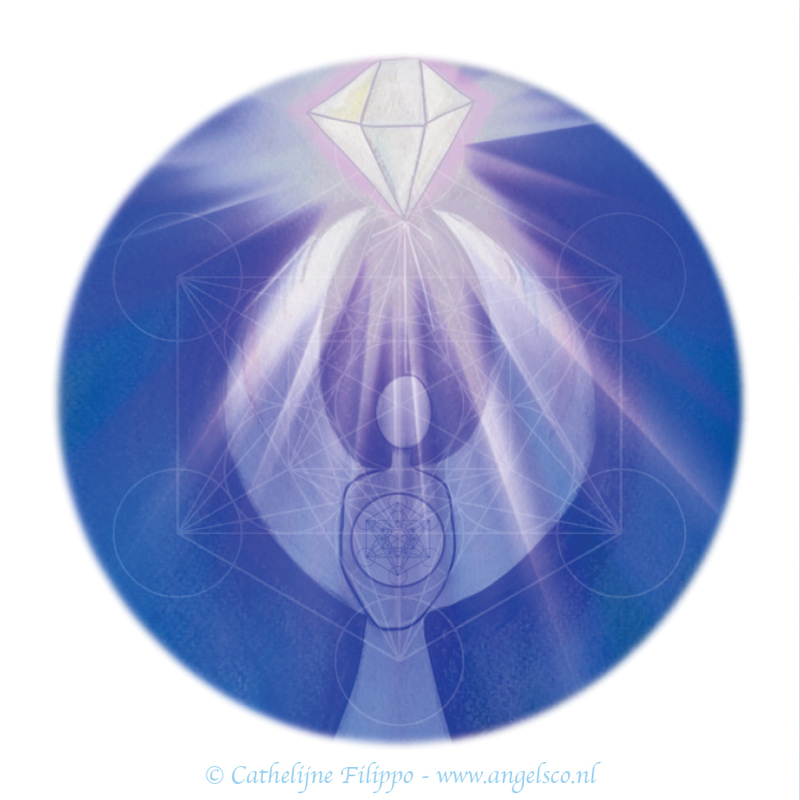 Archangel Uriel guides you to a crystal table. He motions you to empty your pouch on the table. These seeds are all your ideas and plans. As they touch the table some shrivel and others light up like pretty gemstones. Look at them carefully and let the seeds tell you their tale. Realize which ones are viable and not. Look at them one by one. Which seed, which idea looks most radiant? This is the seed that you can start to plant in your life now. Uriel blesses it and the other gemstones. You are asked to then pick up the gemstones and put them in your magical pouch, but to leave behind the shriveled seeds. Uriel gathers these and throws them in a golden fire so that the possible energy of the energy can be reused. He invites you to give any outmoded beliefs and worries to the flames as well. You may ask Uriel to help you with your new ideas and projects. He may give you insights to take with you. You thank the Archangel. He tells you that you are always welcome to return to him with any questions. He gladly helps you realign your thought processes to Higher Truth. You may want to write down the insights your received or the plans you feel need your full attention. I wish you a most blessed Full Moon with new insights and clarity! 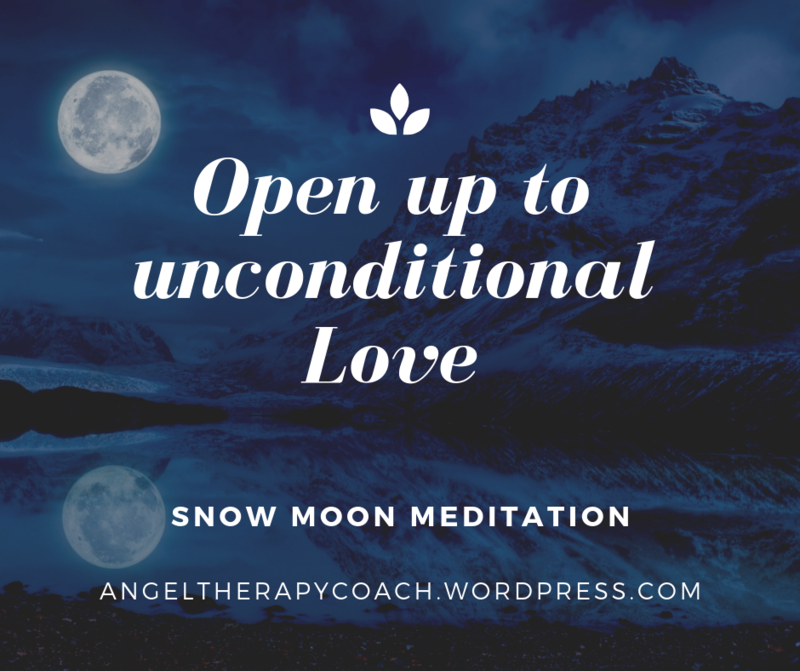 This entry was posted in Angel meditation, Light work, Moon Meditation and tagged archangel uriel, February 19 2019, full moon, meditation, snow moon, supermoon on February 18, 2019 by Angel Light Heart. How has January treated you? Numerologically 2019 is a 3 year. The numerological 3-year is considered a symbol of the trinity and a number that brings happiness. Year 3 also inspires and encourages generosity, strength and positivity. It can be a very creative year in which it is important to really express your Soul. In my last Angel & Light newsletter (if you want to receive it, you can subscribe here) I asked if readers had specific questions, which I could dedicate a blog to. Quite a few of them were about one’s Soul Mission. A perfect question to answer at the beginning of this year. Our soul often has multiple missions in this life. It can be things that we come here to experience and work out, ways we can grow. 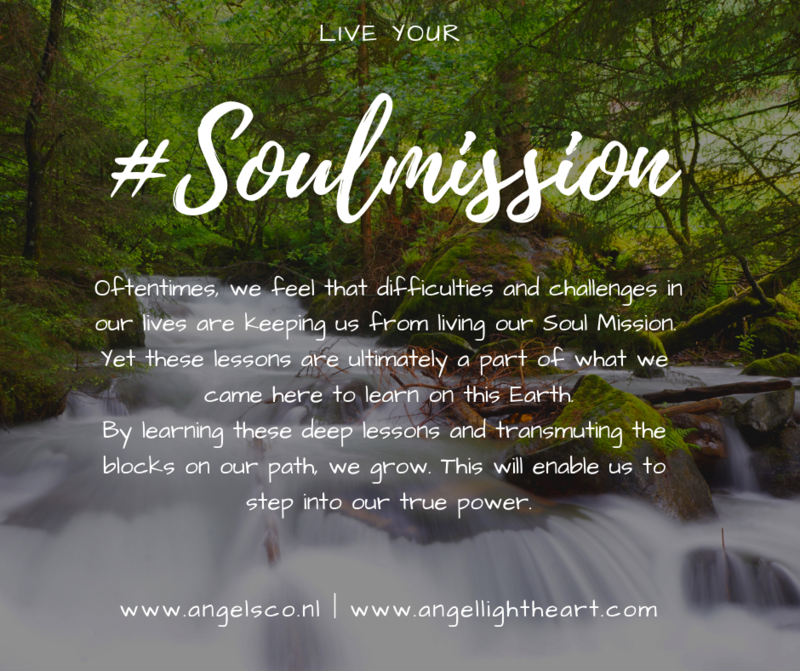 These are often the themes that keep coming back in our lives and that we might not immediately think of as having anything to do with our soul mission. Yet it is precisely those deeper lessons and things we need transform that will enable us to achieve the greatest growth. Through this transformative processes, we increase our vibration and so we also increase the vibration on earth. We often see them as blocks for our soul mission, but it is precisely the themes that our soul has specifically chosen to continue to grow. When we take steps on this path of learning, it will open up the space needed to really stand in our power and shine our light. We shine most brightly by doing in those things that we are good at. Things that we can contribute to this world. We recognise them because they will bring joy to our hearts. They are done in a wonderful flow. Writing spiritual books is one of my soul missions, as wel as doing Light work, coaching, healing, making spirital art, working with crystals. As you can see this is a very varied Soul Mission. Your mission can also develop and change over the course of your life. That is how I started working as a psychologist. I certainly had a calling, but after a while I felt that something was missing and it was time for a new direction. In what way van I contribute something to others or the world? What do I love to do with ease and flow? And most importantly: what would love do and with what do I generate the most Light? You can ask for help from archangel Michael to get a clearer idea of your Divine Blueprint and archangel Jeremiel to see if you are on the right track in your life. This year is the ideal time to really focus on your Soul Mission. The 3 is not just a creative number, it is also an energetic number. It likes to move quickly and you may notice that 2019 will seem a bit like a haze. So make sure you stay grounded. Stay in the moment. Be aware and surround yourself with like-minded people. This will help you to find joy and therefore your soul mission. 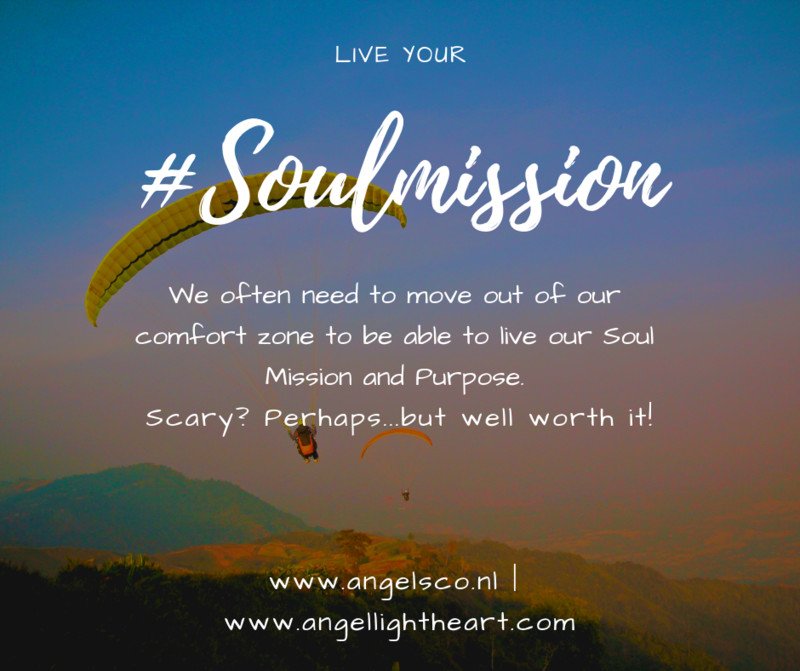 This entry was posted in Personal Growth, Soul based living, spiritual development and tagged angels&co, coaching, shine your light, soul, soul mission on January 31, 2019 by Angel Light Heart. How has your start to 2019 been? January certainly brings lots of incoming energies. Not always easy as it can have quite an impact on the body (and in some cases emotions), but at the same time there is already a lot of potently creative energy available to us in this numerological 3-year. We are starting this year of with a super moon and lunar eclipse on the 20/21st (depending on where you are in the world. Eclipses show us our unconscious emotions. A tie we can use to sort through them and transmute them. The eclipses of 2019 will also bring forward karmic lessons, which in turn can be transmuted. This will all created freedom and new space to create freely. As such it is extra important to connect to your Soul, your Spirit guide team, to meditate and to rest when needed. Be extra gentle with yourself! This full moon is called the Ice Moon. The Ice Moon is a good time to reflect; to go deeply within ourselves. Whilst nature is full of outer stillness, the trees and plants that seem asleep still are active in their deep roots in the earth. Likewise we need to go within. We cannot seed our dreams on frozen ground, we need to dig deep to reach fertile grounds at this time. You can meditate at 7 pm UK time with me and the other Light workers who join in on January 21st. Although we are all in different locations and even time zones, we can still tune in to each other and form a field of consciousness . This will deepen the meditation. If you can not attend at this time, you can also tune in earlier or later. Sit quietly and ground yourself via your earth star chakra, which is found 20-30cm below your feet. The earth star chakra is filled with light and connects you to the crystalline grid around the earth. See this light flow from beneath your feet into your body. Let is fill every cell and then your aura. Feel how this protects you from the inside. Connect with the other Light workers who are meditating at the time, so we form a network of light around the earth . This entry was posted in Angel meditation, Light work, Moon Meditation and tagged archangel jeremiel, full moon, january 2019, lunar ecplise, supermoon on January 18, 2019 by Angel Light Heart. Another full moon is here today. A bit late to send ut this full moon meditation, but better late then never. This full moon is called the blood moon as it is historically the time of year when people would prepare for the hard winter months ahead by slaughtering the pigs. In those days the harvest had gone by and survival was a lot harder without all the technological support we have. The Bloodmoon is a time to say goodbye to that which lies behind us. It is an excellent time to ponder what we wish to keep. It also shows us our vulnerability. Vulnerability and personal weaknesses do not deserve punishment or criticism. They should be given care and attention instead. It is important to take time to get to terms with old hurts and find inner peace. Winter is a time to go within, to collect energy so that we may blossom again come spring. Every season has its own energy and it is unwise to try make things grow and flourish in winter as spring is a much better time to do so. To prepare for the new year, winter calls on us to let go of all that no longer serves us. Emotions and events may be digested. Take time to rest, take good care of yourself and recover and recuperate where needed. Sensitive persons and Lightworkers can also be confronted with the heightening of the frequency on the planet caused by the ascension process. These higher energies can bring to the surface old patterns, which can cause some chaos in our lives. With some this can lead to some physical symptoms such as fatigue. Again, this is a good reason to go within and take excellent care of ourselves. It can also lead to a change in relationships. Old patterns of communicating may go and a new sense of integrity and transparence is needed. The Earth and all souls currently incarnated stand before wondrous and powerful times of change and transformation. We can contribute to this process by taking care of ourselves and by sending love to ourselves, others and the earth. The closer we stay connected to our soul, the purer and more powerful the Light will be that we can radiate to the Earth, to people in need, and to all that lives and needs light. You can prepare for the meditation by taking some time to write down your thoughts on survival, living and caring for yourself. How do you treat yourself? When do you criticize yourself? What about? Could you deal with these things differently, without all the criticism? Can you be more loving towards yourself? And how about taking better care of you? You are a child of the Divine after all! Sit quietly and ground yourself via your earth star chakra. You may then clear and dedicate the space. The aura sprays by Crystal Angel Essences can be a lovely addition to this process (there is also a Mother Mary essence) Especially the one called archangel Michael created a high vibration and calls in protection at the same time. Imagine being in a temple of Light in the Higher Dimensions. The temple is a pyramid of Light. As you enter it you are surrounded by the most wonderful aquamarine crystal that radiates its soft light to you. Breathe in this color. Before you stand a being of pure blue and white light. 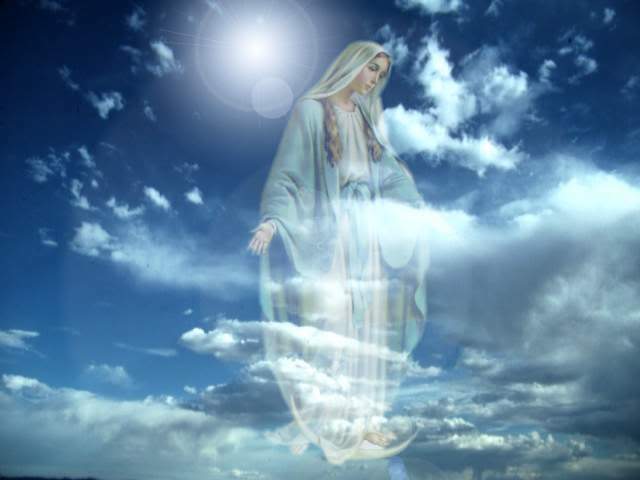 When it comes near to you, you realize this is Mother Mary, the queen of Angels. Mary overlighted the Mother of Jesus and she and her angels bring endless healing and compassion. Picture her angels forming a circle around you and sending you healing from their hearts and hands. Mary looks at you lovingly. She knows your human ‘faults’, but sees the perfection of your soul. She radiates this to you and asks you to open your heart for yourself and to show yourself some respect and love! See your heart chakra as a beautiful flower with 33 and imagine the petals opening one by one. Two of Mother Mary’s angels bring a big mirror to you. Now look at yourself and send love to all parts of yourself that you tend to criticize or which you are unsure about. When you have done this, your True Self appears in the mirror. It is a being of pure and magnificent light. This is who you truly are. The being you may bring to Earth in all you think, say and do. Now see Mary appearing behind you as she puts her aquamarine cloak around you. This cloak is now placed within your energy field. Mary hugs you and you say goodbye to her and her angels. This entry was posted in Light work, Moon Meditation and tagged 2018, blood moon, full moon, meditation, mother mary, november 23 on November 23, 2018 by Angel Light Heart.